Experience the vacation of a lifetime at Seacrest Beach Resort. This is a family oriented community, with palm tree-lined paved roads, nestled between Rosemary Beach and Alys Beach and just a short drive to Seaside, Grayton State Park and Watercolor. There is a selection of Golf Courses to choose from, including Tom Fazio's Camp Creek. The award winning quartz sandy beaches of the Emerald Coast are second to none and the 12000 sq ft lagoon pool, with waterfalls and fountains, is spectacular. Sandy Craic (Gaelic for 'fun times' and pronounced 'crack') is located at the front of the resort. It has both sea and pool views. It is directly across from the entrance to the pool and only a short stroll to the beach. There is also a free tram service if you need assistance with all that beach 'stuff'. 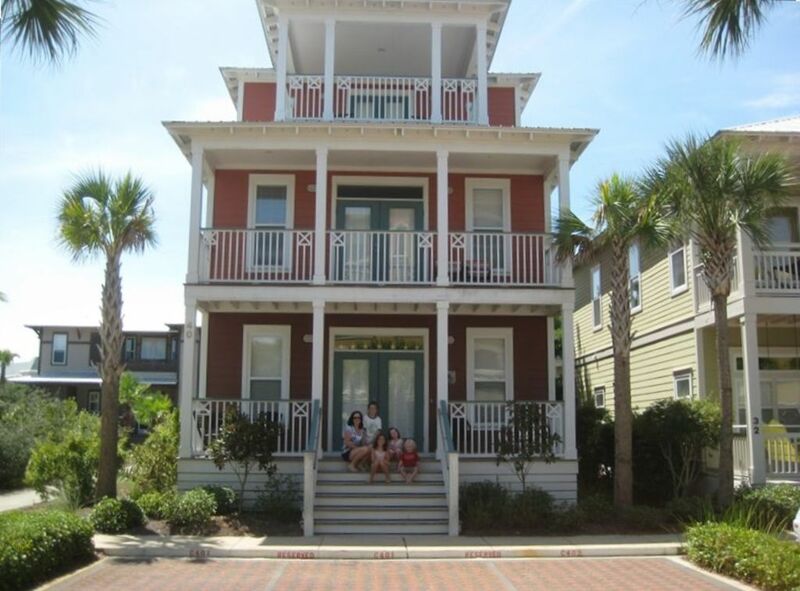 Situated on Seacrest Blvd, you can enjoy watching the world go by on the front deck, or retreat to the back deck. It has two large masters, which is ideal for multiple families. It is very spacious, comprising of over 2400 square feet. There is a total of six decks, offering great views of the pool and the sea. Each bedroom has its own private deck, complete with outdoor furniture. 'Sandy Craic' has been professionally decorated, with comfort and convenience in mind. New hardwood flooring just installed in all the bedrooms... so no carpet now! The dining area has a large table, seating 10-12 guests, and the living area has three comfy leather sofas. The kitchen is fully equipped, along with stainless appliances and granite countertops. There is a bedroom with a queen pillow top bed, which has its own deck. A laundry room and bathroom complete this level. On the second floor, we have a kids room , which has 2 sets of bunks (twin over full), a queen sofa sleeper, and their own bathroom. This room is very spacious, so your small ones can play here and not disturb others. There is also a family room on this level, consisting of another set of bunks and a king bed (with a pillow top mattress). The master bath has a rain shower and garden style tub. You can enjoy spending lazy evenings on the private deck. Finally on the third level we have another master bedroom, with king bed (pillow top) and jacuzzi tub. There is also an oversized sofa, that can convert to a bed if needed, or just to sit back and enjoy a good book. There are fantastic sea views from the private deck of the bedroom, or step across the hall and admire the pool from the front deck. The deck has cushioned patio furniture, so you can relax in comfort. There is also a wet bar with refrigerator, on this level, for your convenience. There are several beach chairs, floaties and beach towels provided for your convenience.